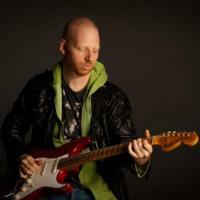 Tune in Wednesday evening from 6-9 PM to hear this week's edition of the Musician's Show, where we will be joined by guitarist Oz Noy. Noy was born in Israel, and began planning professionally at age 13. By his mid-20s he was an established studio musician, performing with the house band of Israel’s top-rated television show. Noy made the move to New York City in 1996, and since, has performed at some of the best live music venues in New York including the Bitter End, the Iridium, and the Blue Note. Noy is known for his highly recognizable sound, synthesizing the tones of Jeff Beck and Stevie Ray Vaughan with jazz harmonic information. The colorful guitar effects, dexterous improvisation, and jazz content are all united under the grooves of blues and funk. Noy just released Twisted Blues, Vol. 2, his follow-up to the highly acclaimed Twisted Blues, Vol. 1, last year. Since his debut record, Oz Live, Noy has featured stellar bands that have included drummers Keith Carlock and Vinnie Colauita, bassists Will Lee and Reggie Washington, and organist John Medeski. Be sure to tune in this Wednesday night!